Facebook today released its app for reading customizable breaking news, info, and entertainment push notifications right on your phones lock screen. 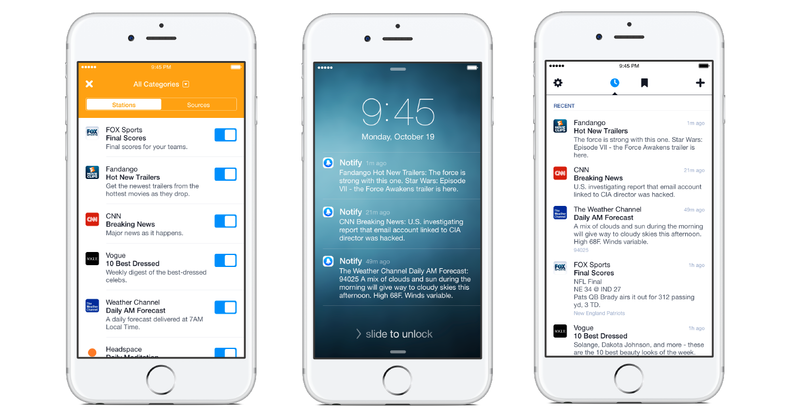 Facebook’s Notify app will let you select from over 70 publishers and customize your alerts. Things likespecific companies, cities, sports teams, music genres and more can be customize with in the app. The main feature that will make this app your favorite among all of its kind is the sub topic alerts. Which allows to choose a specific a sub topic so that you get notified to a story which you personally like. For example : if you are a discovery lover and choose discovery in notify app then app will provide you sub topic like : Nature , Science , space , Wildlife etc. So if you select science then all the science stories from Discovery will come on your way. Facebook worked with 70 launch partners to create Notify stations, including The New York Times, CNN, Huffington Post, Vanity Fair, Techmeme, Fox Sports, Epicurious, Comedy Central, Fandango, BandsInTown and The Weather Channel. For all the Publishers, they will use a special interface to write notification text, select a link, and then publish or schedule their alerts. Also Facebook played a sweet trick here, that is when you liked a story then you can consume the alerts on your lock screen and click through to view the related websites when necessary. So you don’t need to open the app. Sometimes there will a movement when notify will flood you with notification and you will need to silence the alerts. Notify currently feature any ads for now, In Sometime soon we can see sponsored suggestions for accounts to follow. You can download “Notify” on iOS in the US now.